The ticket is based on the talking parking ticket, also invented by FlashPark. It is designed to be placed on a tenant’s front door to let them know that their gas safety inspection is overdue. This is great for any landlord as the ticket helps to protect tenants from the risks of carbon monoxide poisoning and other gas related accidents by making sure that all gas fittings and appliances in the property are safe. The gas safety ticket contains an audio module that plays a message supplied by the landlord. The message plays when the play button is pressed on the ticket. The highly visible yellow ticket is extremely simple to use as it comes with an easy-peal self-adhesive back to make attaching it to doors very simple, and is weatherproof to ensure it isn’t affected by bad weather. The landlord has the option to provide a message in an audio file, or can have it recorded by FlashPark on your behalf. FlashPark’s head of business development, Costas Constantino, has confirmed that the talking gas safety ticket is the latest addition to the company’s range of low cost landlord self-regulation solutions. The company's constant search for innovation in the sector has seen them become a UK leader in landlord self-regulation, and this new ticket looks set to cement that position. Click here for more information about the talking gas safety ticket. Many industrial and technology-focused UK companies are yet to explore the cost advantages in licensing proven, innovative technology from 3rd party organisations. Sourcing technology in this way dramatically reduces research and development costs, enables products to be brought to market very quickly and overall represent a far lower development risk. Our own Ministry of Defence is an amazing fount of innovation, through its division Defence Science and Technology Laboratory (dstl), which collaborates with industry to develop world-class technologies. Whilst these are primarily developed for defence and security purposes, the scope for subsequent commercial applications is vast. Dstl works in close association with Ploughshare Innovations who are tasked with making some of these unique technologies commercially available to businesses. Technology licence opportunities are extensive, and include : cyber security , electro optics, detection & diagnostics (used in clinical, environmental, food hygiene, industrial cleaning, veterinary and decontamination areas), human ID (biometrics, forensics & big data), defence (vehicles, armour, detection, engineering, polymers etc) and trauma science (detection, clinical diagnostics, advance materials and wound treatment). If you are intrigued as to how the UK’s front line can help your bottom line, visit www.ploughshareinnovations.com for more information. So the fine weather has all but gone and festive thoughts are are becoming more frequent as we head towards Christmas. According to Cathy Davey at West End Events, a London Christmas Party organiser, thinking about Christmas now is a very sensible thing to be doing. "Too many people find themselves in a panicked state by the time December rolls around", Cathy says. The office Christmas party only comes once a year and it is important to plan ahead to make sure you get the date and venue you want plus make sure that all your guests are well-looked after (i.e. vegetarians and other special needs). That way the Christmas party is more likely to be a success; a night to remember. If you aren't the organiser of your office Christmas party, you ought to find out the date of the party as soon as possible. Put it on your calendar along with your partner or spouse's party and any other personal parties, children's end-of-year productions and other events. Don't just use your mobile calendar, print the December month out and stick it somewhere prominent, so it can be seen by everyone in the house. It will all become too stressful if you leave it till November or December. Prepare for Christmas now and take it easy! In October 2012 wheel clamping was banned in England and Wales. So what alternatives are there now? Since then infringements will be dealt with by issuing private parking tickets known as Parking Charge Notices. FlashPark offers a new, non-confrontational, alternative to wheel clamping with an online facility that allows you to report unauthorised parked vehicles on your private land. FlashPark will then send the vehicle owner a parking charge notice. The parking enforcement system can be operated on any off-street parking area. So if you are a business, own land or property, or you are a local or district council, and are looking for an easy to manage, cost effective parking enforcement solution, then you should have a look at FlashPark. Commercial business that license technologies initially developed for military use can cut their time to market and reduce their R&D costs considerably. It’s simply a matter of buying the intellectual property for these exciting product and concepts and commercial enterprises are then free to develop and sell them to new commercial markets and industries. We are surrounded in products that use technologies initially developed for military use every day of our lives. Many of the materials used in modern sport equipment started out being rigorously tested on the front line. Some of the most widely used communications tools of the 21st century were military technologies to begin with and everything from HIV drugs to cancer diagnostics have come a long way thanks to military-endorsed or funded R&D. Lower your technology risk, speed-up your time to market and reduce R&D costs by looking into military technology licensing through Ploughshare Innovations. Once upon a time if you owned a piece of land or private parking spaces in a metropolitan area, one of the few options available if someone illegally parked there was to call a wheelclamping firm. Clamping was always a harsh action to take, often ended up causing far more distress to the parker than was warranted. It's also now not legal in many situations. So what is a private landowner to do about parking enforcement then? Vehicle Control Solutions, a London-based firm, has come up with a very novel solution with a product called Flashpark (www.flashpark.co.uk). This non-confrontational service allows land-owners to issue on-the-spot parking infringement notices, which will deter the illegal parkers from offending again. Plus the landowner can receive commission of up to £15 per notice. The whole system is very simple. 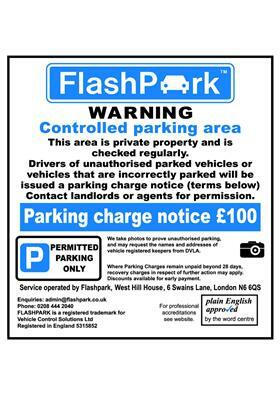 The landowner signs up with Flashpark for free, who then send out a parking warning sign that must be displayed clearly in the restricted area. As soon as someone parks there without permission, the landowner takes a picture of the car in situ, with its number plate visible in the photo, and uploads it onto the FLashpark site. Flashpark will then send out a PCN notice in the post which is enforceable under contract law. Online video is fast becoming the primary way in which to communicate with web users. With 50 per cent of all online traffic now video based, the medium offers a targeted, interactive and effective way to advertise and share a brand and its message. The flexibility and adaptability of online video are also amongst its greatest attributes, allowing consumers to quickly understand the offering through demonstration videos, or to allow the introduction of a company and its service to prospective clients. The unique ability of online video to take web users on a virtual tour of a service or company is also key to its success, as is allowing existing clients the chance to share their experiences through the medium. Industry experts are fast realising that online video advertising is by far the most effective as it is not limited to a local or even a national area, therefore opening up the offering to a far wider audience. With recent research revealing that the vast majority of web users access online video regularly - and took action following the viewing of an online video - this ensures that advertising in this way is an increasingly powerful marketing tool. With viewers across the globe far more likely to engage with online video than with standard web display media, and 75 per cent staying longer on websites with video content - there is no doubting the growing importance and impact of video production for companies who wish to communicate their message to a global audience. It’s time to join the new at-home workforce! So, finally it’s official – the government and businesses are waking up to the benefits of home working. The Telework Association said that there has been a major change in attitudes to home-working over recent years and that it is now preferred not just by staff, but by employers. Shirley Borret, the development director for the association, said that the shift in attitude started with the 2003 legislation that allowed parents to request flexible working. As a result of this, many businesses noticed a rise in productivity among staff working at home and opted to role the policy out more widely. Offering staff the chance to work from home has some rather obvious benefits to businesses, not least the chance to cut overheads. Other benefits include high productivity rates, happier staff and less sick leave. But it’s not just employees that are enjoying the benefits of working from home as a large number of people have started their own businesses from their homes in recent years. A piece of research from Swinton Insurance found that 22 per cent of people questioned said home working would be perfect for them and that one in five is looking into starting their own business from home. So, if your employer is not one of forward thinking types that has embraced this very modern way of working - why not consider going it alone and starting your own business from the comfort of your home office? If anyone reading this blog knows someone looking for a medical sales job, one of our clients, Kirkham Young, is happy to pay you a £250 referral fee if they can place your friend or colleague in a job. Sam Kirkham and her team are a great bunch of people, they know just about everyone in the medical, scientific and hospital sales industry and are very professional. Your contact must inform Kirkham Young that you referred them, however. The other proviso is that they haven't already registered at the recruitment firm. The sales referral page is here. In a bid to banish the 'compensation culture' that has taken root in the UK, David Cameron has announced a crackdown on advertising by no-win, no-fee lawyers offering money to those who present potential legal complaints. Lord Young, who published his health and safety report last week, said that he thought it was immoral for legal firms to offer money to encourage possible litigants to make claims, as it created a 'climate of fear' amongst businesses, in which they took an overcautious approach to health and safety in a bid to avoid accident claims. Lord Young has requested that the Advertising Standards Authority reviews whether adverts promoting these no-win, no-fee law firms breach its code. "It is possible these advertisements may be within the letter of the rules. However, I do not consider that they are socially responsible,” said Young. This new crackdown should make the industry more transparent and weed out the less socially-responsible law firms, making it easier for those who have genuinely been injured in work accidents to find a reputable claims management or law firm with which to pursue their right to compensation. Linda Lee, the UK Law Society president, commented that the government shouldn’t make it more difficult for people injured through no fault of their own to make a negligence claim. Lee said that solicitors will tend to ignore spurious claims and weed them out early in the process. I can't believe how many accidents seem to happen at work – I was chatting to a friend of mine last week who was laid up for weeks after a trip accident at work, so make sure you all take care! My friend Jan was working at a company that was expanding, so they were building an extra annexe onto their existing offices. An interconnected door was being built to connect the old building to the new annexe and the workmen had accidentally left a piece of wood lying partly across the corridor. Poor Jan somehow managed to catch the edge of her shoe on the piece of timber whilst walking back from the canteen and stumbled over, landing really awkwardly at a funny angle. She twisted her knee and tore her cruciate ligament. The poor thing was forced to stay in bed for weeks waiting for the swelling to go down and then had to have a painful operation to repair the ligament. Jan's injury never would have happened if it hadn't been for her company making a mistake and not having the correct health and safety procedures in place and leaving the wood lying around for someone to fall over. All employees have a legal right to be able to work in places where threats to their personal safety are managed and are under control. Jan's company should have check out the risks of having onsite construction happening at the same time as having existing employees in the building and put the correct health and safety procedures into place. Employers, take note! If your business website doesn’t have a blog (meaning one that is updated regularly) then you could be losing out on a significant amount of business. There have been several studies that have found that unique and regularly-updated blog content can provide a lift in the search engines, raise brand awareness and lift the number of converting website visitors. Many top search and internet marketing experts agree that business blog content is at the forefront when it comes to attracting quality links from third-party sites. 1. SEO. Your website will attract more links with a business blog. The more links, the better your ranking. Moreover, blogs get indexed over 400% more than standard websites. 2. Direct traffic. Attracting links is not just great for the search engines – it means more traffic generated from those 3rd party sites. 3. Retention of visitors. A quality business blog not only brings more visitors in, it keeps existing and new visitors on the site for longer, raising the chances of a conversion. 4. Generate trust. Compelling, quality business blog content builds trust in you and your products and services; it shows you care and that there are real individuals behind the website that want to communicate. 5. Build authority. A business blog will demonstrate your understanding of your industry better than extra pages of sales copy. 6. Build the brand. The business blog will allow you to articulate your offerings and differentiate your brand, adding value to the site and to your business. 7. Advanced customer service. The blog will provide another outlet for your customers to provide feedback on your service. Over time you will have enough readers to elicit response on ideas to develop your products and services. If you don't have enough time to write a regular news blog, don't despair. We can update your blog remotely with unique, personalised news copy - as often as you like. Call us today on 020 8870 9300.